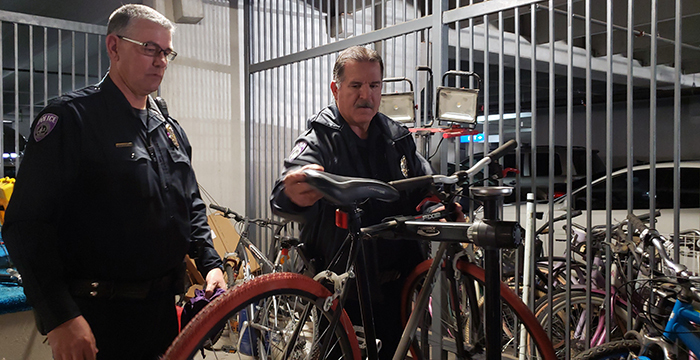 GCU Police officers Bill Green (left) and Mark Potts volunteer their skills as bike and auto mechanics. GCU Police officers Mark Potts and Bill Green tend to work in tandem for the greater good. It was in the midst of Move-In Day madness when they connected with the weary dad of twin daughters: two daughters, twice the number of bath caddies, desk lamps and comforters to haul up narrow stairs and through bustling hallways. After Dad left the emergency flashers on and drained his car’s battery, the officers jumped into action to jump start his vehicle. That’s when they heard the twins proclaim, “Dad, we need bicycles!” after seeing other Lopes cruising the campus. 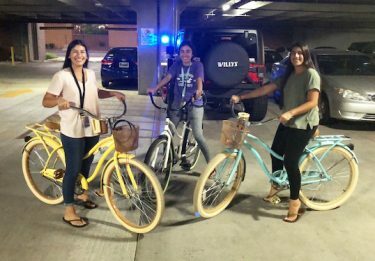 These three Lopes — two sisters and their roommate — received loaner bikes from Potts and Green. “We said, ‘Time out!’” Potts said, advising dad and daughters to wait and see if they really needed them. “After two weeks, we get a call from the girls. They said they want bicycles — and their roommate wants one, too,” Potts said. Three girls, three reconditioned bicycles provided by Potts and Green, free of charge. “We take what we can find and make as many good bicycles as we can,” said Potts, who, along with Green, repairs and refurbishes bicycles that have been abandoned on campus. It’s something the two do out of their own pockets; there’s no official budget for what they do, which is look for ways to help students – however they can. “We enjoy the opportunity to take care of them,” Potts said. Potts, who served 27 years with the Phoenix Police Department, and Green, who put in more than two decades with the California Highway Patrol, started working at GCU within a week of each other in February 2017. 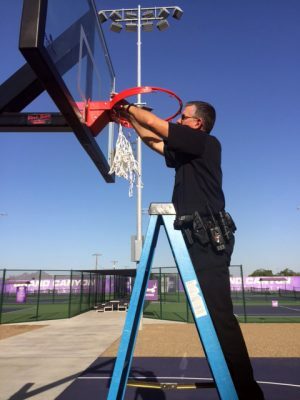 It was soon after the University began supplementing its Public Safety Department with the full-fledged GCU Police Department. They started to notice things they could do around campus. 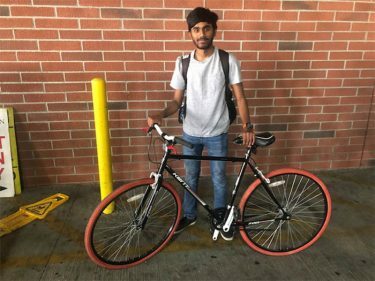 Bicycle theft is one of those common crimes they thought could be reduced with a free bicycle registration program to help identify a bicycle’s owner, particularly on a campus where 25 of the exact same bicycle might exist. Students stop by the Department of Public Safety, where the department keeps records of the bike’s serial number, make and model, along with the owner’s contact information. “We have registered about 600 bikes,” Potts said of the department, which has been able to locate and return lost, misplaced or stolen bikes to their owners. They also find a second life for some of the abandoned bikes. Students will leave the bikes behind rather than go to the trouble of transporting them back home. Potts and Green give them about three weeks to respond to notices about their abandoned bikes and, if they don’t hear back, start collecting them. The officers also have painted faded pingpong tables GCU purple in Thunder Alley and donated tennis rackets to students. They get them in working order, using components from the arsenal they’ve collected, enabling them to offer “loner bikes” to students. Over the past two years, they have collected more than 200 abandoned bicycles. This year alone they have distributed more than 20 reconditioned bicycles to students, and in 2018 they donated more than 50 bikes to a local charity to distribute to needy families. It’s in the belly of the Grove Garage where the magic happens. In the “bike cage,” Potts and Green have set up a bicycle repair and maintenance area. At one end: abandoned bicycles are lined up in a row; at the other, a table, air compressor, tools and WD-40 bike lubricant await the next repair. “We work on any student’s bicycles that need anything,” Potts said. They’ve changed tires, adjusted brakes and switched out components. They also purchased an air compressor accessible to students in the garage – all work that wouldn’t be accomplished, they said, without the support of the department or their supervisor, Sgt. Eric Reed, who often refers students struggling with bike or vehicle maintenance or repair to the officers. The two also carry tools on their golf cart for car or bicycle repairs on the spot. They jump start cars with a 12-volt jumper box they purchased, help with small maintenance repairs, change batteries for students and retrieve keys from locked cars. Potts even has loaned some of his personal triathlon bicycles to the GCU Club Triathlon team. Students last year used one of his tri-bikes to ride in a college championship event at Lake Havasu. He also donated one of his sets of golf clubs to a student who said he wanted to take up the game but could not afford a set of clubs. Reuel Maddela received a bike after his was stolen in the fall. 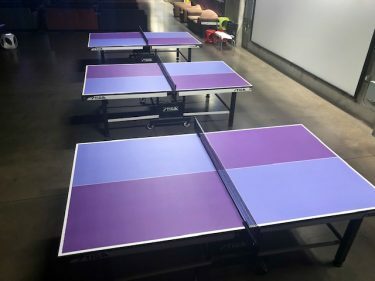 Beyond bikes, the officers have refurbished the faded pingpong tables in Thunder Alley, painting them a fitting GCU purple, and they have purchased and donated pingpong paddles to students and to the dorms when they can find equipment at a good price. Green, a former high school tennis coach, has purchased tennis rackets he’s given to students. Potts remembers one time when they saw a group of students playing tennis. Two were on the court; two others were watching. Green asked why the others weren’t playing. “We only have two tennis rackets,” they said. In short, if something on campus needs to be done, Potts and Green are not the kind to let it go. He added that it’s important to him to establish a sense of rapport with the students: “Our biggest goal is being approachable,” he said. They wore costumes for Halloween and, driving around in their golf cart, gave away about 2,500 pieces of candy. Potts pulled out a safety vest – to cheers from the Havocs – at a neon-themed basketball game. Students also have told them their relationship troubles and career concerns. Green repairs a basketball net. “We had one kid on the verge of giving up (on college). He said, ‘I feel like I’m in a tornado all the time.’ Bill had the greatest conversation with him,’” Potts said. To this day, that student often reports back to them on his progress. Two of Green’s daughters attend GCU, and he said he loves working in a small department, like GCU Public Safety, that makes him feel like he’s part of a team. “I look forward to coming to work every day,” Potts added, as he keeps his focus on what’s most important: the students. Follow GCU senior writer Lana Sweeten-Shults at lana.sweeten-shults@gcu.edu or at 602-639-7901.